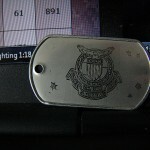 2012-2013 “Officer Club” Membership Drive | The Fighting 1:18th! The Fighting 1:18th is having our annual “Officers Club” membership drive. The purpose of this drive is to help offset some of the yearly costs associated with the website. We are 100% advertising and sponsor free, and expect to remain that way as long as we can continue to! We have always felt that accepting money from manufacturers or retailers would cheapen or influence some of the reporting and reviews that we do, so we decided we’d go at it alone and do things out way whether people liked it or not. It gives us the freedom to do what we want, and say what we think, and so can you! This site is completely paid for by the staff, and from donations by our members. + Our undying love and admiration for helping us be the last, best place to BS without BS! * The dogtags are currently in the works, and will be mailed out as soon as we have them in hand (Hopefully before SDCC!). ** Send NSA a PM if you are interested in setting up the Email address. As of right now, all the perks will be year-to-year donation dependent, so they will last until your subscription runs out. This MAY (and most likely some will) change during the course of the year. If you do not have Paypal, would like to donate MORE than $32, or would like to donate through regular mail, please send me a message on the forums. The donation period is from May 25th, 2012 though August 25th, 2012. Thank you everyone who helps us out! ** ALSO NOTE ** all existing Officer Club memberships will expire on July 1st of each year unless renewed, regardless of when you sign up.